The International Association of Registered Financial Consultants (IARFC) is issuing a call for nominations for their Board of Directors. Two current members will have fulfilled their two term limits and will be coming off the Board leaving vacancies for individuals who wish to fill these positions. The Board will look to 2018 as the IARFC year of expansion both domestically and internationally. Starting October 1, suggestions can be sent by any IARFC member (via email) to the Nominating Committee Staff Liaison from those who wish to serve personally or endorse a candidate for consideration. These nominations are welcomed from the Association membership. Bio information, intent to serve and an optional statement on their intentions to promote the Association will be collected. On November 1, nominations from membership are closed and the announcement of the initial candidate selection by the IARFC Nominating Committee is released. Those who did not make the initial selection by the Committee are notified and have an opportunity to collect 10 member supporters to keep their names on the ballot. Nominations are officially closed on November 20. 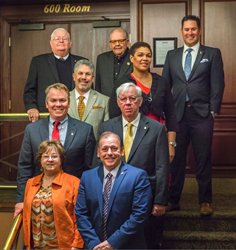 Members of the IARFC Nominating Committee include Chairman H. Stephen Bailey, Vice Chairman Nicholas A. Royer, Treasurer Jon Rogers, and Secretary Michelle Blair. On December 1, an election is conducted by the Board of Directors with the results being announced by December 15. During January and February, current and newly elected Directors make their travel plans to attend the Annual Board Meeting – April 16, 2018 and 2018 IARFC Biltmore Conference in Asheville, NC at the Biltmore Estate – April 17-19, 2018. To send in nominations contact the Nominations Committee Staff Liaison at susan(at)iarfc(dot)org. The IARFC promotes the growth of the Association for their members and the clients they serve by providing a continuing source of information, education and networking and an adherence to the promotion of ethical behavior.